With Summer around the corner where temperatures will soar to the 90’s and 100’s, eating is the last thing on the mind for some. In fact many will be looking for cool and refreshing things to stave off some of that internal heat. Here are two cool and sweet recipes that’s sure to bring a moment’s reprieve for some. 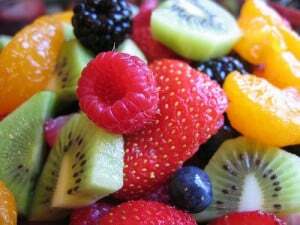 Start by dicing up your fruit into bite sizes. In a medium to large bowl combine all the fruits, gently mixing to meld all the fruit’s flavors together. Once the mixing is done add your nuts to the mixture. *Note* if anyone has nut or fruit allergies you can use different fruits and no nuts in this salad. Serve right away so the bananas don’t turn brown. If preparing ahead of time, you can add some lemon juice to the bananas and they will keep until ready for dessert. Be sure you add a dollop of the Cool-whip to the dessert. *Note* The small pkgs of nuts can be found in the baking section of the store. The small pkg of walnuts cost around $1.18. This recipe will feed four people, but can be adjusted to feed more. In a 9×11 pan spray or rub on vegetable oil, then set it aside. Next make the instant banana pudding according to the directions. Dice the bananas and add it to the instant pudding, then fold in one of the tubs of Cool-whip. Put it in the fridge to keep cool. In a bowl take one of the packages of graham crackers and crush it to a fine mixture. Add in enough butter to make a crust for the bottom of the pan. Once the crust is patted into the bottom of the pan add a layer of the pudding to the pan, then a layer of Cool-whip from the other tub, then do a layer of graham crackers. Repeat the layers until you run out of pudding or graham crackers. Once this dessert is assembled, put some Saran wrap over the top and stick it in the freezer until frozen. Cut into 2×3 squares and serve. *Note* you can also use Vanilla Wafers or Oreos, and the generic of these cost a lot less than buying the name brand. Now you’re set with two desserts costing mere pennies for a serving. Each will be refreshing for those hot Summer months.